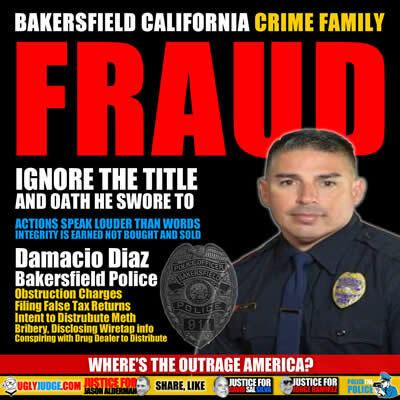 Bakersfield California Police Damacio Diaz is a criminal and fraud. If you can’t trust one of them who worked his way up the ranks and infected the department we can’t trust any of them. Damacio Diaz, 43, was arrested on November 20, 2015 and charged with abusing his position of trust as a police detective when he conspired with and assisted a narcotics dealer in the operation of the dealer’s drug organization. Would they flee bargain the same way with non-police criminals? Yet this fraud used his position for gain and greed. He hid behind a badge of shame, why do we trust so much and downplay his punishment when in fact he probably caused more problems and evils than other criminals who never would have been given the benefit of doubt. Watch as these cowards resign or retire to keep benefits, cheat the tax payer out of thousands of hours of paid salary and run to hide with the help of their fellow officers. This is limited to a few officers? What do you expect them to say, it’s all about lying and down playing the truth to stay employed and stay in business. Chief Greg Williamson says misconduct is limited to two officers, but the attorney for one of the officers says it is more widespread. We could hear from two officers caught up in a federal investigation into corruption and bribery in the Bakersfield Police Department. Former detective Damacio Diaz is scheduled to plead guilty to three felonies in federal court in Fresno this afternoon. He may speak to the public or to the judge. In exchange for the dismissal of 14 felonies, Diaz admitted he and his police partner stole methamphetamine from a narcotics dealer and sold it. It has to be emphasized that former detective Patrick Mara has not been charged with any crime, but he was Diaz’s police partner and he matches the career profile of the second detective chief Williamson said he expects to be indicted. Former BPD detective, Damacio Diaz, sent shock waves through the community Thursday when he admitted he and his former police partner, stole 9 pounds of meth, seized from a drug dealer. Diaz admits they later sold the drugs. Diaz also admitted he took bribes from a local meth dealer and tipped the dealer off about police investigations. Diaz’s partner has not yet been named by the BPD, but at a news conference Friday, chief Greg Williamson said he expects that former partner to be indicted by a federal grand jury. Williamson said the un-named partner retired from the police department two weeks ago. Court records show Mara was a partner of Diaz in 2012, the year Diaz says the drugs were stolen and he is one of only two officers to retire within the last month.